Normally, I would think a covers album. 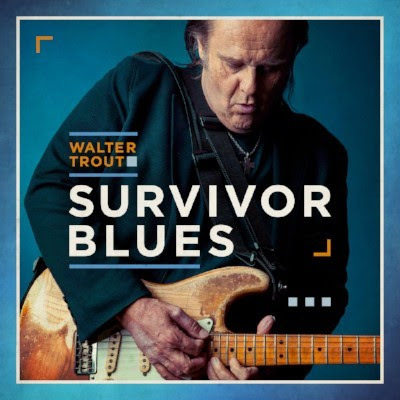 But when it is from a maestro like Walter Trout it takes on a different dimension as the title captures this is Survivors Blues. This is not the standard blues, Walter has dug deep in the hidden gens that most musicians and bands do not take time to explore as they give us another version of Stormy Monday etc. As we press play we are embarking on a journey of hidden treasures re-interpreted by Walter and the phalanx of great music that he has surrounded himself so that the album does justice and we fall in love with these often overlooked gems of the Blues vast discography. How to open and set the scene on this album which is a personal project of Trout himself? He starts of with a Jimmy Dawkins number – Me, My Guitar And The Blues the very title captures the heart, soul and essence of Walter Trout himself. Opening with blues guitar playing where the notes are considered never overplayed or overcomplicated. This is guitar to soothe, excite and hold your ear in listening mode you do not want to to end then it grows with Walter’s vocals and chords extended and low from the keyboard. Followed by a song whose title reflects the political turmoil and debates that are everywhere. Be Careful How You Vote, this wasn’t written for now, but was a Sunnyland Slim number from the 1980’s. With glorious harmonica answering the guitar and vocals. This is upbeat and a clever relevant re-interpretation. The energy grows with Women Don’t Lie and Sugaray Rayford joins the party with luscious soulful vocals as they celebrate Luther Johnson’s ‘Woman Don’t Lie. The interplay between the vocals is fantastic with a hat being tipped at the tradition of holler and response and then some stellar manipulation of the six-string telecaster. This is an album of contrast and textures. The juice deep groves of the bass drives Sadie with keys and vocals as Hound Dog Taylor’s is re-invented. This is blues for today, not the re-hatching of the same. Masterpieces re-shaped this is not a musical equivalent of painting by numbers, safe and secure we can sit back expecting what is coming. This is blues bold, orchestra and fresh music to set your blues flame alight. Every number has something to say, every track you will listen not once or twice but leave on repeat. If there was one artist Walter would cover it would be John Mayall the British blues godfather. Going back to the Seventies we are treated to Nature’s Disappearing even more relevant today. The interplay between drums and harmonica gives the number a gritty, dirty edge that suits the lyrics and gives the number a demanding sense of urgency. It is a call to action that we should all take heed and join. Following this is Red Sun a beautiful number where Walter’s vocals are strong and guitar strung out as he is found sitting on top of a mountain under the Red Sun with an angel feather in my pocket. This is another number reflecting life’s journey and final destination. The power is immense. Now Walter guitar tempo changes picking out Something Inside Of Me from Elmore James catalogue. The tone is 100% Walter, without losing te Elmore rhythmic drive. The last three numbers continue the exploration of blues from a previous generation. Out of Bad Luck, we have a touch of Magic Sam and the despair of a woman leaving for another man we are back in the land of despair with Walter. With a guest appearance of Robby Krieger on Goin’ Down The River as Mississippi Fred McDowell’s is re-imagined. We are taken back but never trapped in the aspic of the past this is Blues that has a vibrancy of being played in the now. Unrehearsed and natural the nots flowing with ease as the river we are going down to. J.B. Lenoir’s, God’s Word closing out this twelve track masterpiece. The essence of JB is captured and electrified under Walter’s manipulation of the Blues. The album, Blues Survivor demonstrates why the blues has the power to sustain a range of emotions, textures and tones. Blues like the musicians on the album will survive will be played and re-interpreted and re-shaped. It also makes you take time out and explore the unknown, forgotten and neglected there wondrous blues to discover. This is probably one of the best Walter Trout Album. Why? It is thoughtful, constructed with so the meaning of the songs shine out and the narrative flows. The guitar work is skillful not self-indulgent there is no squeezing in as many notes as fast as possible. With the bar already set high by Walter Trout this is a massive achievement. It as if his inner magic has been released through his lyrics and superlative guitar playing since his long illness, transplant and recovery. He has the pure joy and zest for life which permeates into every note he plays and word he sings.